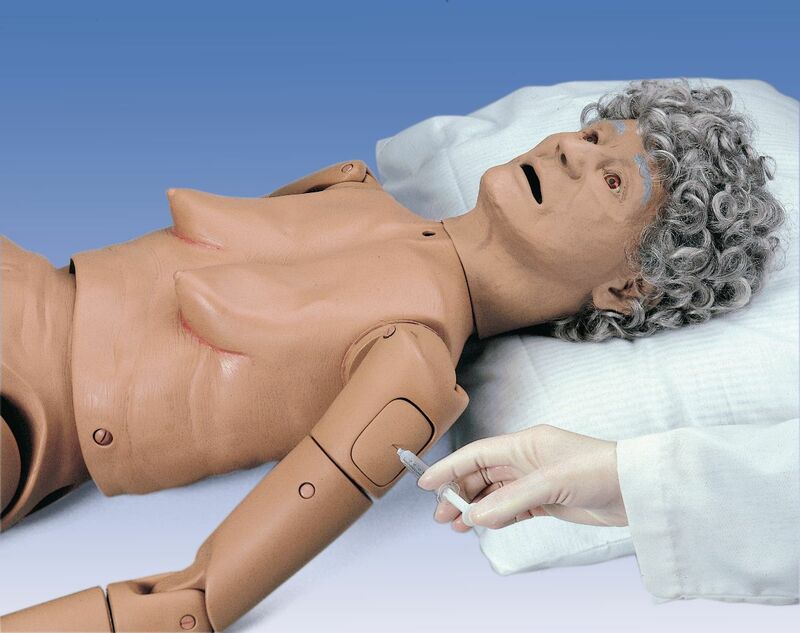 These nursing manikins feature am elderly appearance and are convertible between male and female. Each manikin offers a complete life-like range of motion for realistic patient positioning, and non-pinching joints - truly moves like a person. The manikin is lightweight and simulates a full-size adult, with an overall female appearance. It easily converts to a male with removal of the wig and attachment of the male genitalia. Basic Geri allows for basic visual inspections, and patient care simulation, including bathing, changing clothing, bandaging, patient positioning, patient transfer, eye and ear care, and bandaging. Besides basic nursing skills this manikin also allows the practice of male and female catheterization. Skin wrinkles, reddened skin fold, a dilated pupil, a stage I decubitus sacral ulcer, a normal mole and a cancerous mole are represented. The neck and all major joints are fully movable into any natural human position. Hands and feet are made of soft, flexible material for added realism. Meets all OBRA (Omnibus Budget Reconciliation Act) requirements. Delivered in storage carton. 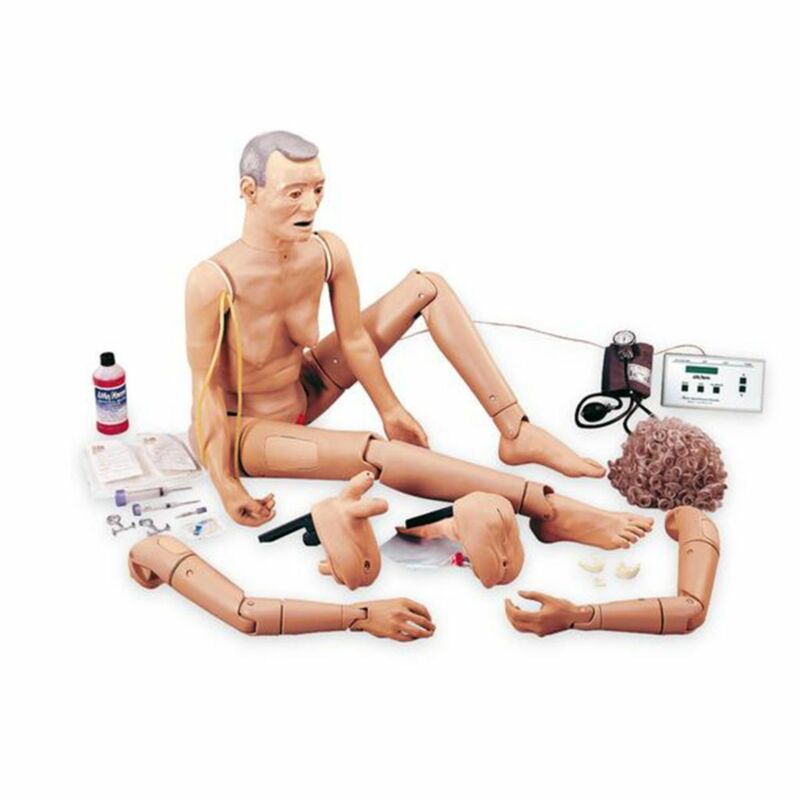 The Complete manikin includes all the skills training of Basic Geri, and adds the ability to practice injections, Enema administration, catheterization, prostate exam, nasogastric tube placement and gastrostomy procedures. The Advanced GERi™ Manikin simulates over 35 nursing and medical procedures, or the basic and complete versions and also includes Right IV Training Arm with a shoulder intramuscular injection site, Left Blood Pressure Training Arm that reproduces all five Korotkoff sounds and allows the instructor to vary systolic and diastolic levels, pulse rate, volume, and auscultatory gap.